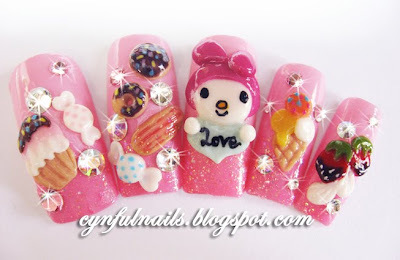 Cynful Nails: New nail art! 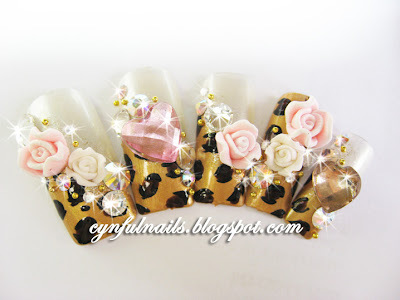 It's been a long time since I created some new nail art samples. Had some time on my hands today and created this 2 sets. This is from Nail Max! And the one below is after my modification. Huge gems, hearts, pop up roses on a leopard print base. My Melody with love, doughnuts, candies, cupcake, ice cream and strawberries and cream. Have seen many designs from nail magazines with all these stuff but I've never thought of putting them together till one of my customers told me she wanted all these on her nails! (I almost fainted when she told me. hahaha.) For this set, credit should be given to Clara too! You guys should see the melody nails she created! Customer emailed me her pics and told me to create something similar for her, and so.. my first attempt with My Melody and all the food stuffs!